The following country’s markets are closed for the national holiday: China, Hong Kong, South Korea, and Singapore. The Chinese Yuan increased 16 bps against the dollar despite the market being closed. The Japanese stock market increased +0.14%. The YoY for the Nikkei is still negative, slipping -3.56%. The same cannot be said for the Aussies as the ASX 200 is up +2.54% YoY. The market increased +0.34% today alone on the back of the Reserve Bank of Australia holding the cash rate the same (1.5%) for the 30th month. Looking at the market from an International perspective, however, the AUDUSD slipped almost -9% YoY! Holding the Nikkei in JPY (as the JPY is flat against the dollar) may be the better option right now. That is why we stress the importance of understanding currencies for global investing. Gold and silver decreased 20 bps and 60 bps respectively to 1315.02 and 15.76, further diverging the price relationship. Stock markets in Europe were rather dim; the CAC, FTSE, and DAX lost today by 15, 5, and 40 bps respectively. It was also apparent that capital flows were moving out of the Eurozone as the EUR also decreased against the USD by 28 bps. The GBP and CHF increased against the USD and subsequently against the EUR too. As for other economic news in Europe, the employment rate in Ireland remains at its lowest rate in 11 years since the financial crisis of 2008. German Factory Orders came in at quite a surprise after a reduction of 1.6% when the estimates were a modest increase of 0.3%. Russian consumer price inflation increased to +5%, which is the highest inflation rate since Jan 2017 after the government raised taxes by +2% to produce a 20% tax rate. 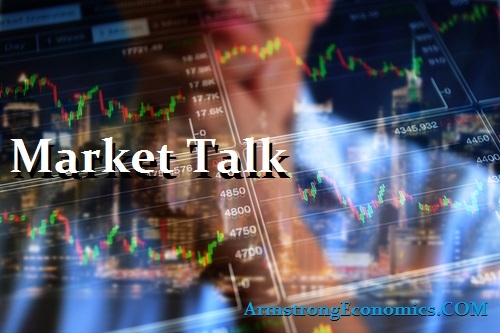 Coming off last evening’s State of the Union address from Donald Trump, and some so-so corporate earnings, U.S. equities, Treasury yields and Gold all end the day slightly lower – while the Dollar and Oil rise. During an interview with CNBC, former U.S. Central Bank Chair Janet Yellen hinted that the Fed might cut rates if “slowing global growth” begins to negatively impact the U.S. economy. While this is a relatively logical statement, it is also an answer to a “is it possible” question. Of course the answer is yes. Anything is possible. Whether or not it is likely is a different story. Since December 2015, the Fed has hiked rates seven times (currently standing between 2.25-2.5%). Yellen predicts that U.S. economic growth will begin to slow down in 2019 compared to the prior fiscal year, but positively noted that unemployment within the country is at a 50-year low. After a strong week, U.S. indices began to decline today: Dow (25390.3 close, -21.22 points, -0.08%), S&P 500 (2731.61 close, -6.09 points, -0.22%), NASDAQ (7375.28 close, -26.80 points, -0.36%). After producing a 52-week high on Monday, Brazil’s BOVESPA declined throughout the day before closing at the low (94635.57 close, -3675.64 points, -3.74%). Canada had a slightly better trading day, albeit largely flat with the TSX Composite closing only marginally up (15,712,.31 close, +9.62, +0.06%), as did the TSX 60 (938.07 close, +0.25 points, +0.03%). A representative for the Bank of Canada announced that decreasing oil prices and consumer spending have contributed to the country’s lack of economic growth, noting that uncertainty in U.S. trade has contributed to unsteady confidence in the economy. Brent and Crude both brushed off yesterday’s losses and increased almost +1% to 62.45 a barrel. Crude increased 67 bp to 54.12. The excuse for today was a tightening oil supply, however, yesterday the U.S. inventories rose. The Japanese are expected to auction off their 30-year bonds this evening. Additionally, they plan to release data on foreign reserve investments in Japanese stocks and bonds. Japan -0.01% (+0 bp), US 2’s 2.52% (-0 bps), US 10’s 2.69%(-1 bps), US 30’s 3.02%(-1 bps), Bunds 0.16% (-0 bp), France 0.58% (-0 bp), Italy 2.85% (+6 bp), Turkey 14.08% (+10 bp), Greece 3.90% (+0 bp), Portugal 1.67% (-0 bp), Spain 1.26% (+0 bp), and UK Gilts 1.21% (-2 bp).